If your new footwear is primarily suede, treat them with protective spray. Water and suede are a bad combination, but that doesn’t mean you can’t wear them all winter. With a little bit of preparation beforehand, your suede boots will be fully protected and ready to wear. It will also make them easier to clean too, as any dirt should just brush straight off. Break them in. New leather shoes can feel great on your feet, if you spend the time breaking them in gently. Don’t walk too far in them initially – give them a chance to soften slightly for a more comfortable wear. Wear them for a few hours a day until they feel more comfortable, and then soon you’ll be able to wear them for all day comfort. Don’t wear them out – gently does it. Leather shoes are so versatile it can be tempting to wear them all the time, but as they absorb moisture and odour as you wear them, they need a day of rest in between wears to let them dry out and reduce the risk of them starting to smell. Leave them to rest for 24 hours between wearing them, and if you happen to get them wet, never put them near a radiator to dry out as this can cause the leather to crack. Clean them thoroughly. Leather shoes will last for years with a little bit of TLC, but that does mean that you will have to give them a good clean using quality shoe polish and brushes. 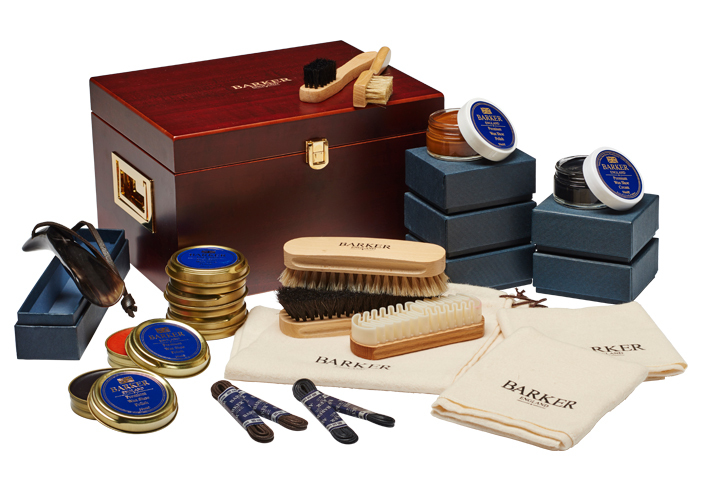 Thankfully, we have just the thing in our professional valet kit, which comes with a variety of colours of shoe polishes, brushes and clothes for taking expert care of your new leather shoes. Store them properly using a cedar shoe tree. Leather shoes absorb moisture, so after you take them off, you should store them using a shoe tree, which will not only help them to keep their shape, but will also help to wick moisture away from them, keeping them smelling great and in perfect condition. Failing to do so can result in your shoes beginning to rot from the inside out, and if you’ve just invested in a quality pair of shoes it makes sense that you’d want to keep them in the best possible condition for as long as possible.